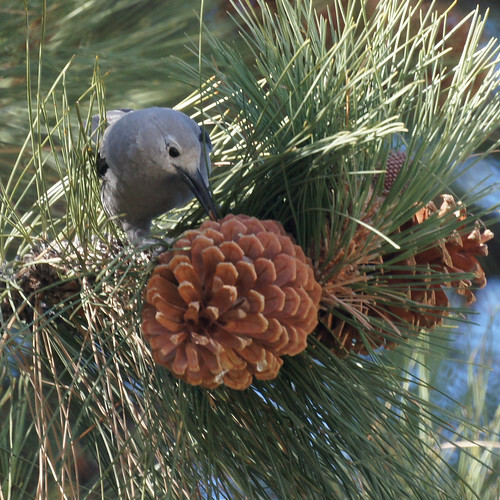 Mike first heard about the Clark's Nutcracker two weeks ago and decided he needed to see it. 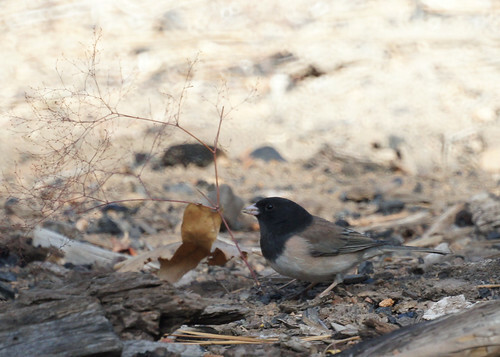 A bit of internet searching and asking around turned up the info that they live high in mountains and feed on pine seeds. Mike enticed Chris with a visit to nearby Oak Glen for apples after birding. We set out for Onyx Summit in the San Bernardino National Forest. 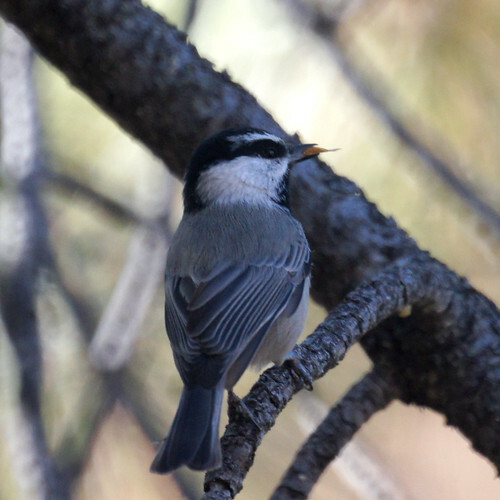 We stopped first near Jenks Lake and didn't find any nutcrackers, but there were some acorn woodpeckers, red-napped sapsuckers, white-breasted nuthatches, juncos, and mountain chickadees around. We made it to the Onyx Summit but didn't see any birds at all. We turned around, headed down Rt 38 about a mile, pulled over and walked around a while. It wasn't birdy but just as we were heading back to the car, Chris spotted two large birds across the road. 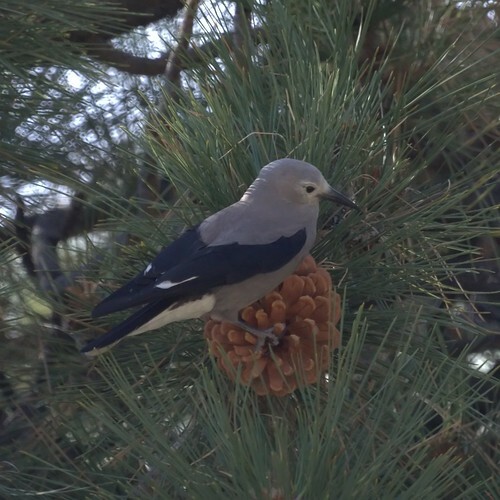 We decided to cross, and then Mike saw a Clark's Nutcracker on a pine cone. 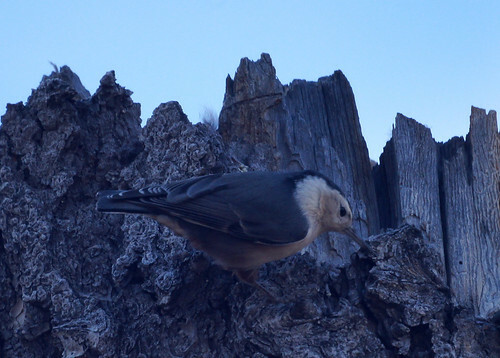 There were 4 to 5 in the pine trees, and we watched for about 10 minutes as they pulled the pine seeds out. They can store the pine seeds under their tongues and bury them in the fall to eat later in the winter. In one photo, the nutcracker looks a little like a chipmunk with its throat swollen- they can store up to 100 seeds. 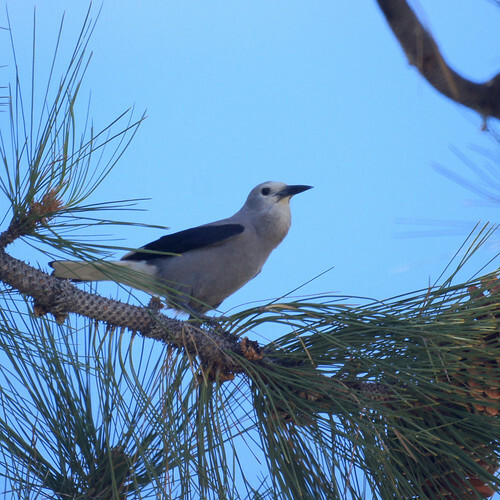 It was a little past the peak of apple season, so Oak Glen was a bit of a disappointment, but we are glad we got to see the Clark's Nutcracker.